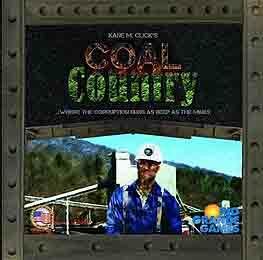 Coal Country is rife with questionable conduct, with the competing mine foremen "influencing" multiple aspects of the coal industry to their own benefits. As the boss of a mining company, it is your job to sit at your desk and plot where to send your most "influential" foremen. By successfully "influencing" the price of coal, permits, utilities, and construction, your company can expand and boost the profitability of its operations. Your job is made all the more difficult by the ever-shifting nature of the markets, from turn to turn, round to round, and game to game. It is your responsibility to determine how and when to act in order to capitalise on a potentially beneficial marketplace. If your mine is not built wisely and safely, a share of your company's profits will be lost after the end-of-year visit from the mine inspector. The mining company that has the most money at the end of the year wins the game.